Allow secure handling of bricks and blocks. The forged heel is enlarged (bent and upset manufacturing process) for maximum strength. The inside heel area can be ordered with an optional special "concave type" radius that will reduce damage to the edges of the product. Some applications may require our optional elongated tube (floating eye) so that when the load is being set down on an uneven surface, the forks first being relieved of the load can rise. This prevents damage to the product when the forks are withdrawn. 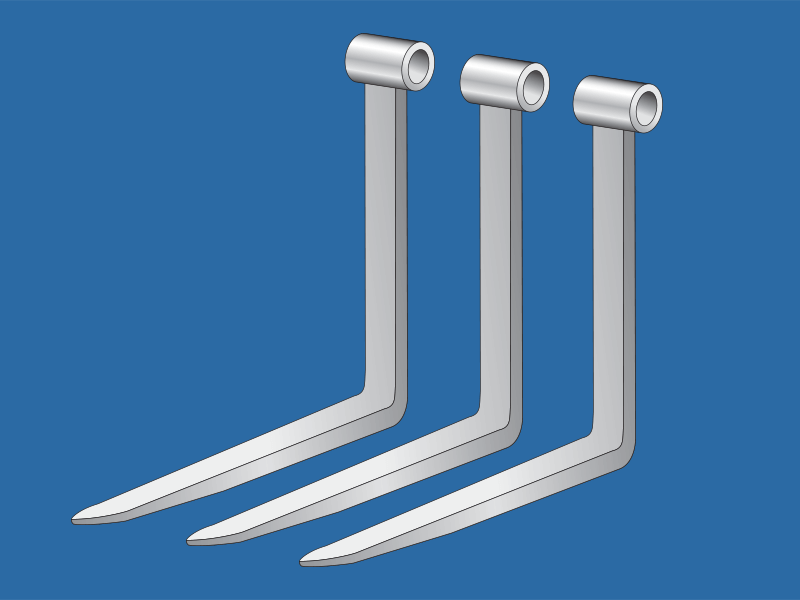 Block handling forks can be ordered in any length required and are manufactured with tube, hook, or floating eye mountings. Typical section sizes used for block handling forks are 2"x 1.5"(T x W) and 2"x 2"(T x W). Special sizes are available upon request.